"Someone need not be perfect to be a great dancer. Feeling a soul is more important than what the body can do"
Jean Veloz, the sensational!, showing more style in her pinky than we might ever hope to know! 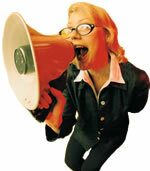 YES, WE STILL NEED MORE LEADERS FOR "JEAN AND DEAN WORKSHOP"! 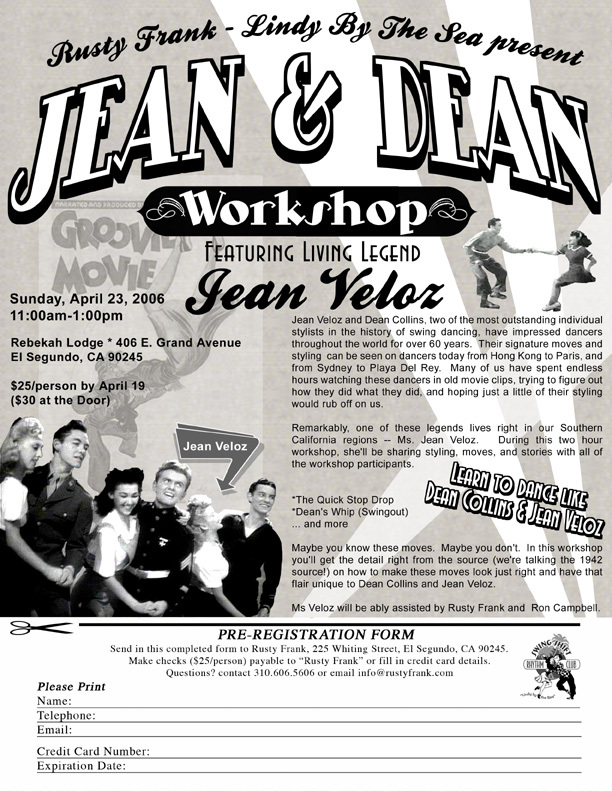 Hey gang, we have a great sign-up for the Jean & Dean Workshop. But, we really need more guys (leaders). Seriously! We need more guys. As it stands, it's gonna be very uneven (we'll rotate aggressively, but it sure would be nice to have more leaders confirmed). This really is one of those chances of a lifetime, friends. Jean Veloz (80 something years old) is going to be there in person! She's never done a workshop here before! She's been brought to Germany, Washington DC, but never here for teaching. When I realized this, I thought, "This is nuts! I'm gonna ask her to do a workshop at Lindy By The Sea." And, she said "YES." So let's have a GREAT showing for her. Don't make Jean Veloz think that the boys don't care! Remember, the workshop will be a nice even split between men's and women's styling. It's for both leaders and followers! And, you'll be hearing from someone who was there about "back in the day" when swing WAS king. AND, bring your camera! You won't want to miss this chance to have your picture taken with Jean Veloz! I have also reprinted my letter of yesterday below under Added Attractions. Rusty and Ron now have a series for those who want to take their dancing to the next level. The course, entitled "The Master Track - It's All About You" is limited to twelve students. The April-May series is fully booked, but we are already taking reservations for June-July. 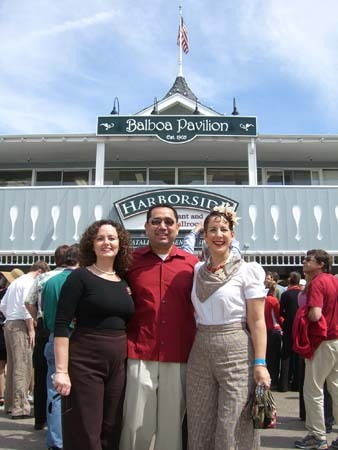 Here's the first Master Track, 2006. They surprised us by dressing up for their final class. 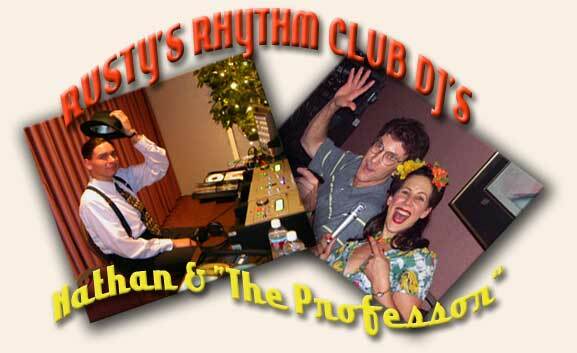 THE WISEGUYS DEBUT AT THE RHYTHM CLUB TONITE! Hey gang, the Wiseguys, an eighteen-piece big band, are making their debut at our Rhythm Club this evening. Make sure you make 'em welcome! And have a great time enjoying our classic swing music (for your dancing and listening pleasure). 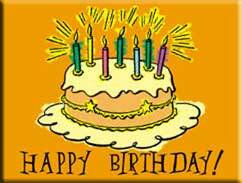 There's gonna be cake and a great birthday dance! WORKSHOP WITH LEGENDARY SWING DANCER JEAN VELOZ! Click and this button and sign up right now! Save $ when you pre-register! 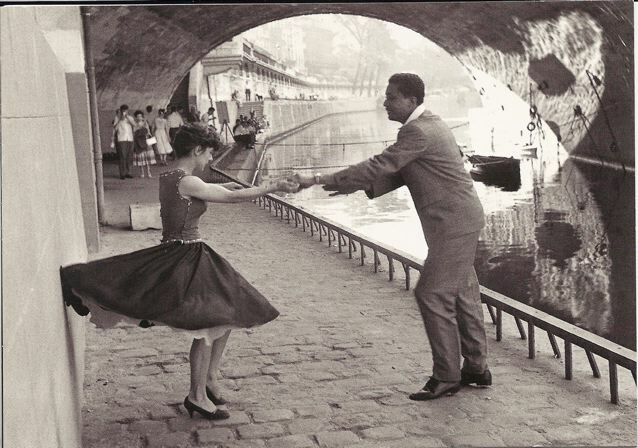 When we think about the dancers from the 1940's who really changed the face of our dance, one dancer who readily comes to mind is the great Jean Veloz. 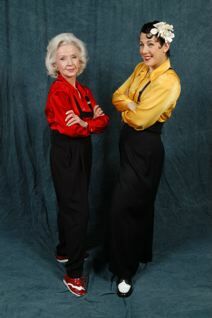 Now in her 80's, though you'd never know it!, Jean is as vivacious as she was back in "Groovie Movie" (1943). We are thrilled to announce a special workshop just for you with this amazing dancer. So mark your calendars now -- Sunday April 23rd, 11am-1pm. Rusty hamming it up with legendary Jean Veloz. I first met Jean Veloz in 1997, at the Boogie Baeren's Dance Festival in Lansberg, Germany. I was immediately taken by this extraordinary woman. She was "no spring chicken" (as my 103 year-old great aunt used to say about herself) but Jean sure didn't recognize this! She was vivacious, adorable, indefatigable, fun, and super friendly. And when they showed clip of her from the '40's, my "fan status" was firmly and forever set. I've been her fan ever since! Jean's style is one I have been yearning to absorb since I met her! Even if I could just get a smidgen. 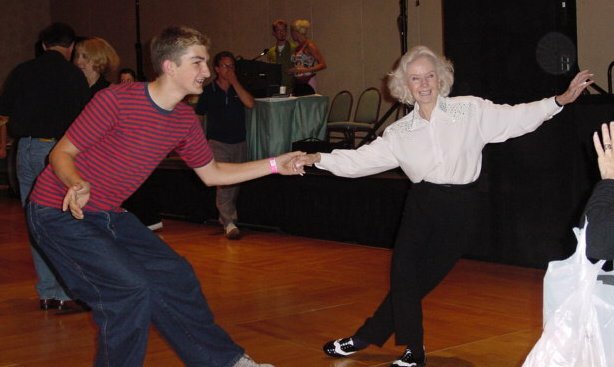 Although she was never Dean Collin's dance partner, she was in his little dance crowd, and often dance with him. She has fabulous stories about those days. You'll love to hear them at the workshop! After some years swing dancing, she actually moved over to Ballroom dancing and became the partner of Frank Veloz (of Veloz and Yolanda fame). I have seen clips of her dancing with him, and they are absolutely breathtaking. 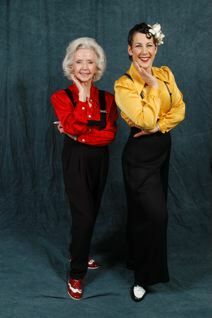 They eventually married, and continued dancing together for many years. 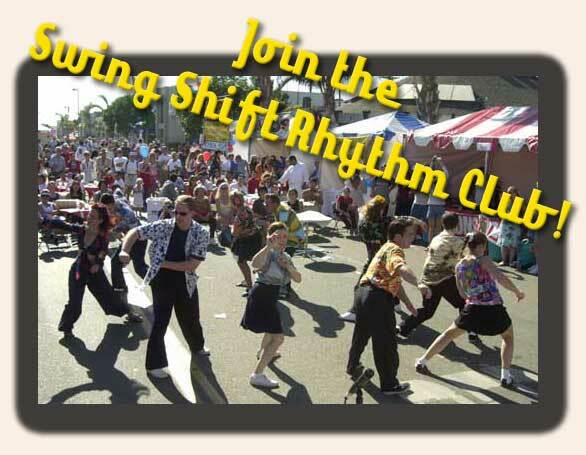 Frank Veloz passed away some years ago, and Jean's friends began encouraging her to check out this "swing revival". And.... they finally succeeded and took her out swing dancing for the first time in decades. She LOVED it! And has never stopped. She finds it a delicious bookend in her life. She loves all the people, the young people, and her old friends, she loves reminiscing about the good ol' days, and she loves dancing! She is one of the most special people I've ever known. Take it from me, if we could bottle whatever it is she has, we'd all have it in our medicine cabinet and be taking a dose a day! Remember, this very special workshop is THIS coming Sunday. 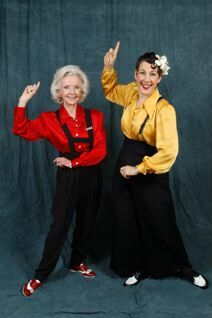 Join us for one of the greatest opportunities of your swing dancing life -- meet and learn with swing dance "living legend" Miss Jean Veloz herself -- at the "JEAN AND DEAN WORKSHOP". Every now and then, people just appear who offer up their time and talent to make our swing dance community that much better. Recently another such great one stepped up to the plate and offered up his graphic designing skills, one Joe Hansen. You may have already noticed the beautiful "Jean and Dean" flyer which he whipped up in about an hour and a half. Here's another little goodie which will be appearing next week, a new class bookmark postcard. Thank you, Joe! You're a genius! Joe (dancing with Katie) surrounded by his art! That's right, you can still buy the entire 6-dvd set of The Track Series at the discounted price of $125. The price will be going up on April 26th, so why not take advantage of the savings now? If you were to buy all six at the regular price, it would be $180! ORDER YOUR SET TODAY AND SAVE!!! "The Track Series" was developed by Rusty Frank and Ron Campbell in 2005. 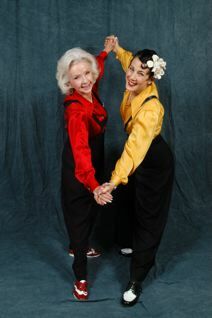 "We wanted a program that included just about every move a Lindy Hopper would want to know!" It's turned out to be a sensational program, so much so, that Lindy By The Sea students insisted Rusty & Ron make correlating DVDs. The six DVD set matches the 6-month program that Rusty and Ron teach at Lindy By The Sea. Each Track is color coded and contains stand alone moves. In other words, students can choose any or all of the DVDs. 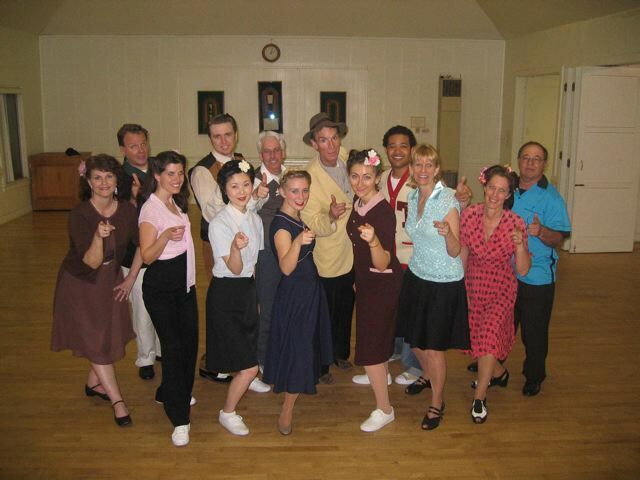 Each Track contains curriculum covering variations of the following moves: Swingouts, Charleston, Sugar Pushes, Slides, Boogie Steps, Hollywood Style, Savoy Style, Related Dances (1920s Charleston, Balboa, and Collegiate Shag), Styling, and Stop Reverses. ORDER YOURS TODAY! CLICK HERE. TAKE THE LEAD - I've already seen it twice, and enjoyed it immensely both times. It's a dancing movie! And it's good! 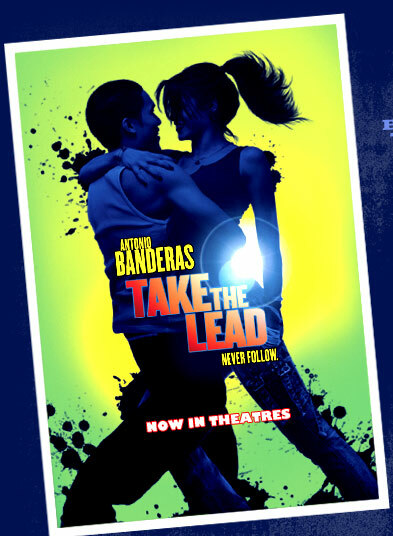 "Take The Lead" is based on a true story about a man who has brought Ballroom dancing into the New York public schools. The story focuses on his first attempt with a very tough group of detention high-schoolers. When they first hear Ella Fitzgerald, they scream and put their hands over their ears... but you can guess what happens as the movie progresses. There are so many truly touching moments in this film. And, the writers really seem to be able to capture the magic of partner dancing. I have always been one to believe that it is important to put our money down AT the movie box office -- to tell Hollywood what we want to see (good movies! movies with dancing!). If you can, see it at a theatre, don't wait until it comes out on dvd. Of course, when it does, you could always purchase it, too, to show you really support the good stuff. Give yourself a real treat! Take a look at their Trailor, and then run and see the movie.